SINGAPORE - There are more job seekers in Singapore who have been unemployed for 25 weeks or more. 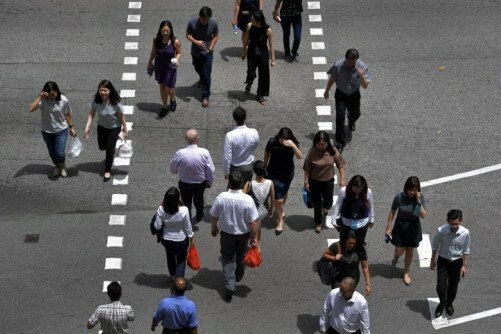 This trend emerged even as the unemployment rate for Singaporeans declined slightly, according to the labour report for the third quarter of 2017. The long-term unemployment rate rose to 0.8 per cent in September, up from 0.7 per cent in June, according to figures released on Wednesday (Dec 13) by the Ministry of Manpower (MOM). This rate measures the proportion of the resident labour force that has been unemployed for at least 25 weeks. Overall, the unemployment rate in September remained at 2.2 per cent after accounting for seasonal variations. For residents - Singapore citizens and permanent residents combined - the rate remained unchanged from the previous quarter at 3.1 per cent. Retrenchments in the third quarter - from July to September - dropped to 3,400, down from 3,640 in June. This was lower than the 4,220 layoffs in the same quarter a year ago, and lower than preliminary data that the ministry released in late October, which placed the retrenchment rate at 3,600 in September. The pickup in local employment growth in the first three quarters of the year was mostly in four sectors: community, social and personal services; administrative and support services; financial services and information and communication. However, total employment in the first three quarters of the year contracted by 21,400. The bulk of those who left were work permit holders in construction and manufacturing, said MOM. Total employment sat at 3,412,000 as of September. Meanwhile, 66 per cent of residents who lost their jobs in the first quarter of this year were back in jobs in the third quarter. This was up from 64.5 per cent who re-entered the workforce within six months a quarter earlier, and the highest rate since the fourth quarter of 2015. Older workers aged 50 and above, and professionals, managers, executives and technicians (PMETS) continued to fare less well, with re-entry rates of 55.9 per cent for the former and 63.6 per cent for the latter. Nevertheless, the rates improved from the previous quarter. Job seekers continued to outnumber job vacancies, and there were 87 job openings for every 100 unemployed people as of September. This seasonally adjusted ratio improved from the one in June, which saw 85 openings to 100 unemployed people. MOM said that local employment is expected to continue to grow next year, in line with the Ministry of Trade and Industry's 2018 GDP growth forecast of 1.5 per cent to 3.5 per cent. But it will remain uneven across sectors. "Job-skills mismatch will continue to be a growing challenge due to on-going economic restructuring and shifts in composition of the resident labour force," said MOM. Mr Mayank Parekh, chief executive of the Institute for Human Resource Professionals, said it is encouraging to see that the labour market has improved slightly. But he cautioned that it is too early to say what this impact will be on long-term unemployment rates. "Companies are still cautious when it comes to hiring," he said, citing how short-term contracts and a trend of hiring workers on demand is changing the nature of the job market. Look for your dream job right here at our job portal!